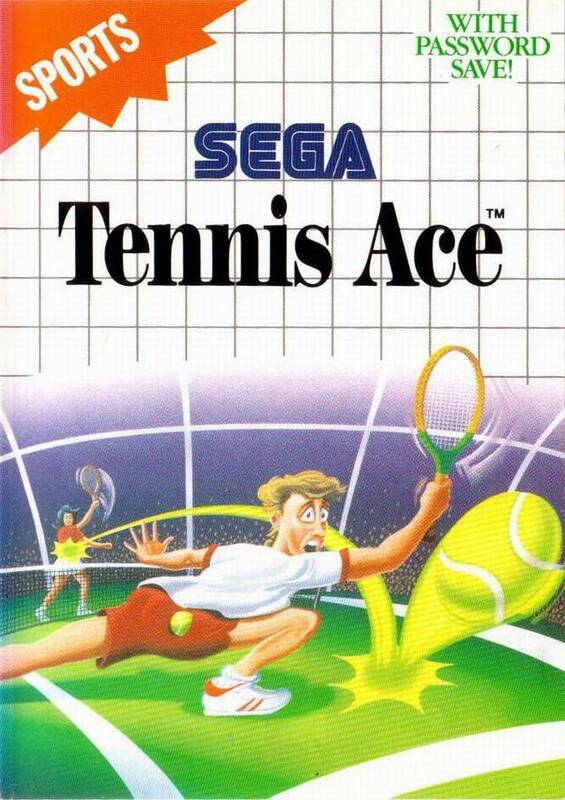 I’ll play your tennis game, Sega. Just as long as I don’t have to play against this guy. 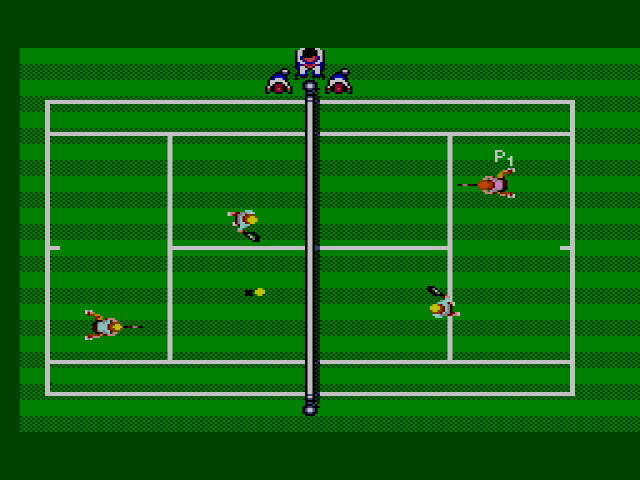 Sega’s console options for tennis have been less than luvely thus far. 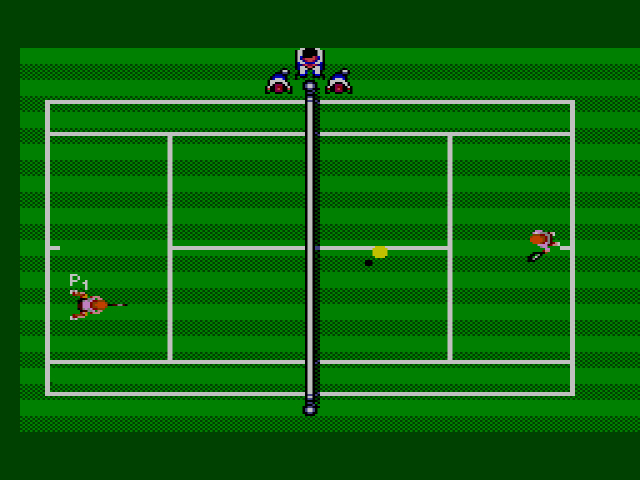 Champion Tennis for the SG-1000 played like a colorized version of Pong with people in place of paddles; while Great Tennis for the Master System demanded perfection from all the youngsters who just wanted to hit a ball back and forth. Tennis Aces gets the underrated sport mostly right. Serving the ball can be tricky, but the high dollar racket action is always smooth and enjoyable. Double the Billie Jean King for your buck. Rather than present bare-bones tennis seen in every home tennis game since, er, Tennis, Sanritsu makes it rain options on the player. Whether you want to get used to the controls with a Training Match, customize to your heart’s content in an Exhibition Match, or play 36 games in a row in the Tournament, you have the power. The Training Match is one-on-one gameplay that offers no perks other than learning how to play. The Exhibition Match allows you to choose everything before you play: the type of court you want to play on (Lawn, Hard, or Clay), how many sets (1 set match or 3 set match), and six types of background music (#5, with its mixture of melancholy and momentum, is my personal favorite). You can also choose to play Singles or Doubles with the computer or with a friend. Doubles with a friend is, of course, the preferred option, but I was surprised at how well the computer-controlled teammate kept up with me. Tournament is for the real tennis aces, the ones who sleep with their racket and dream of healthy yellow balls forever bouncing across lawn courts. 36 matches all across the world, several countries, a variety of courts, some single matches, some double. Thank Agassi that passwords are given after every open so you don’t pass out from exhaustion. There are 16 (!) players to choose from, all with different attributes. Each player has numbers assigned to their technical skills, power and speed. The higher the number, the stronger the player is with that particular trait. After you win an Exhibition Match, you will be given two experience points to increase whichever trait you choose; if you win a Tournament, you’ll be given five experience points. In addition to these stats, players also have one of three different titles assigned to them: Net Player (one who plays best close to the net), Stroke Player (one who plays best in the back of the court), and All Rounder (one who plays best anywhere on the court). Unlike the skills, power, and speed, these titles don’t make a heap of difference in how the players hit the ball. This unfortunate soul looks a bit like the Cryptkeeper. But at least, he’s an All Rounder. Whenever you start a match, whether Tournament, Training, or Exhibition, you always serve first. The camera will zoom in on the player from the side, you’ll press Button 1 or 2 to throw the ball in the air, then press the button again to hit it. Once the ball has been tossed in the air, you must time your hit just so. Too high and you’ll fault it on your opponent’s side of the court. Too low and you might hit the net, fault it in your side of the court or swing and miss altogether. Since the ball ascends and descends quickly, you’ll have little time to make a decision. If you find yourself biffing constantly, head over to Training until you get the hang of it. If the hot pants don’t make him choke, that eerie kid staring at him might. 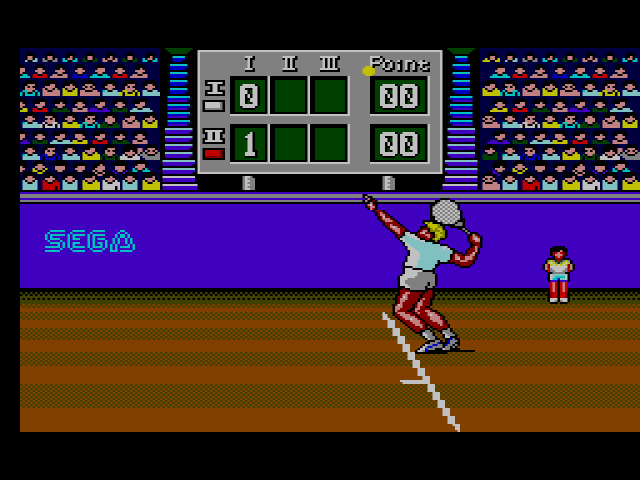 Steep learning curve for serving aside, Tennis Ace is one of the better 8-bit tennis games up to this point. All the players control fluidly, the extensive in-game options ensure replayability, and the tennis itself is loose and engaging. Even the top-down camera angle – an angle I thought would detract from match play – doesn’t get in the way of the experience. 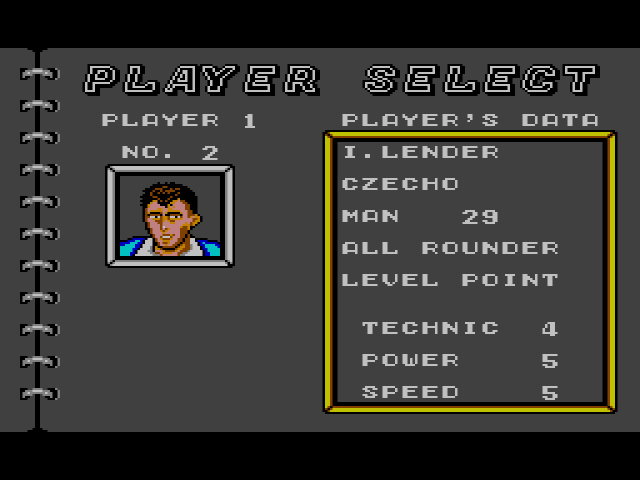 Most importantly, Tennis Ace made me play more virtual tennis than I ever thought possible. Few football/baseball/basketball games can say as much for their respective sport. Lol at the eerie kid comment. Making me think of that kid from that Japanese horror movie the Grudge. What is he doing standing there on the court all by himself. I think your game is haunted.